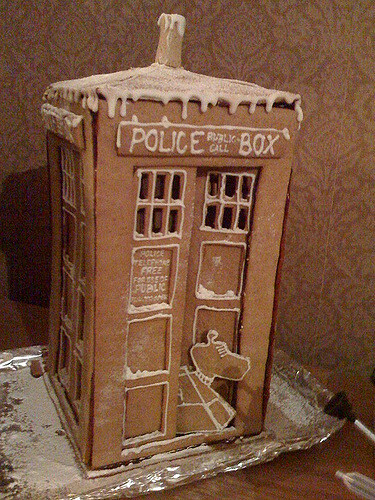 A gingerbread made from TARDIS. Looks deliciously awesome. Credit: Anna-Maria Oléhn. Clearly I’ve only just begun to explore the frontiers of gingerbread construction, especially geeky gingerbread construction. This gingerbread TARDIS (pictured at left) is just too darn cool; I love the attention to detail, especially the window panes AND K-9 the robodog. I’m also impressed that it stayed together long enough to take the picture (especially after last years less-than-successful icing glue experiment). Hats off to Anna Marie for a most excellent project.